One of the most famous tourist attractions of Southern Germany is certainly Neuschwanstein Castle, the model behind the fairytale Disney castle. We were keen to stop by this time around since we had a car and were only a few hours away in Innsbruck. The drive through the Austrian countryside was quite a contrast to what we had experienced on the European roads so far. Everyone stayed in their lanes, there were no life-threatening overtaking manoeuvres, no tailgating/flashing of lights/honking of horns. Very civilised really. We were not used to the northern weather having spent the 6 weeks in the scorching climate of the Mediterranean so when we saw a few grey clouds dotting the sky, we dressed conservatively in light sweaters and jeans. The closer we got to our destination, the darker the weather got, and the poorer our choice of light clothing felt. 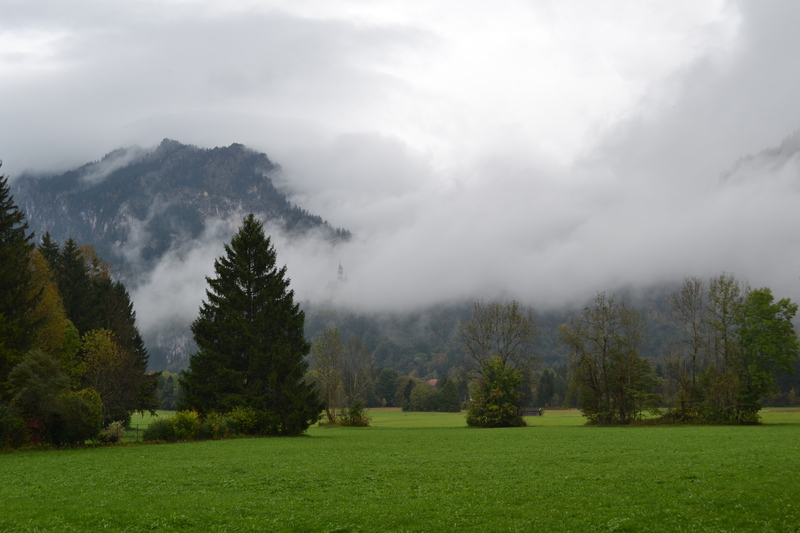 By the time we were at the little town of Schwangau at the base of the castle, we had been driving in the pouring rain for at least an hour, and this had put a slight dampener on our excitement… We couldn’t even see the castle since it was raining so hard. 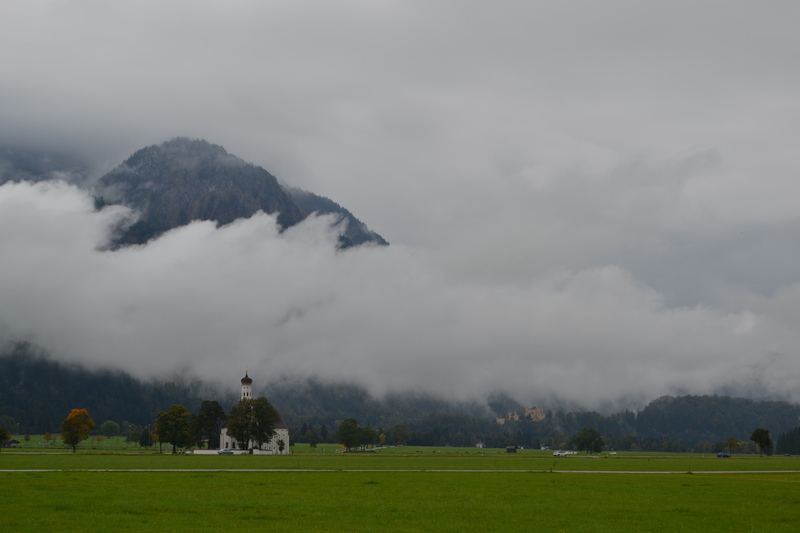 We decided to wait out the storm and got lunch in one of the restaurants in the town of Schwangau, with our fingers crossed that things would miraculously clear up and the sun would come streaming through the clouds. We had no such luck. After an hour and a half of waiting, things had barely changed from when we arrived. To kill some more time, I decided to go and see when the tours would be going. 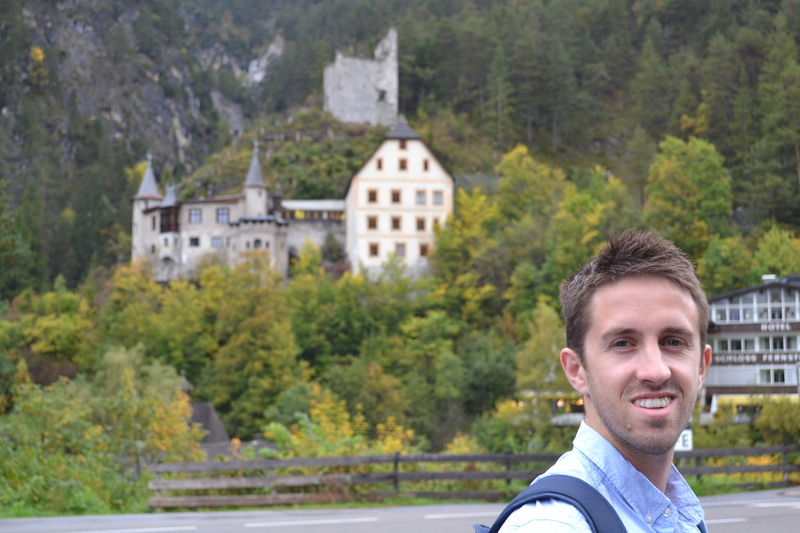 Just for a bit of background, you can’t go to Neuschwanstein unless you are on a tour. They operate tours in all sorts of languages. Since we had not done any tours on our trip so far, we were happy to pay to do this one and get a little more information about what we were actually seeing. Unfortunately, the next English speaking tour was not for another 3 hours. Since it was still raining, freezing cold, we did not have jackets or umbrellas and you have to walk 2km to get up to the castle, we decided to give it a miss as I was not paying to get soaking wet on a tour which I could not speak the language in. Pretty disappointing day really since I had been so excited about seeing the castle and it is one of those things that everyone seems to do and get such cool photos from. Other than that, fairly uneventful. Not much to explain about some of the photos that we took on our drive around, apart from the fact that the area was very beautiful. Even though we were disappointed with how this particular excursion turned out, on the balance of things we were extremely lucky that this was the first time during our whole trip that we had not been able to do something because of the weather. Most of the days where there had been rain we conveniently had quite large travelling legs to do. The day was such a cold one that when we went back to Innsbruck, I went straight to the shops and bought a pair of nice leather boots as I was so scared about how the weather was going to be for the rest of the trip and when we got to London.